High-density oligonucleotide microarrays containing a large number of single nucleotide polymorphisms (SNPs) have enabled genome-wide association (GWA) analysis to become a reality. We used the early access Affymetrix Mendel Nsp 250K chips in a GWA case–control pilot study to identify genomic regions associated with breast cancer. We included 30 randomly sampled incident invasive breast cancer cases aged <45 years without deleterious mutations in the BRCA1 or BRCA2 genes, and 30 population controls individually matched on age, ethnicity and geographical area. The overall genotype call rate was 97.13 ± 1.33% for controls and 97.48 ± 1.42% for cases. Comparison was made between cases and controls for 203,477 genotyped SNPs using (a) unconditional logistic regression (ULR), (b) conditional logistic regression (CLR) models with adjustment for the matched pairs, (c) allelic tests for single marker tests and (d) haplotype trend regression (HTR). Genomic control and EIGENSTRAT methods were used for correction of population stratification in appropriate models. We demonstrate the similarity and dissimilarity of results from different statistical analyses. We found several possible significant regions harboring biologically meaningful known candidate genes, such as genes encoding fibroblast growth factor, transforming growth factor, epidermal growth factor, and estrogen synthesis enzymes to be associated with early-onset breast cancer. In single marker analysis, none of the SNPs were statistically significant after correction for multiple testing. However, haplotype association tests, using 90730 tag-SNPs, suggested two regions in GLG1 and UGT1 genes retaining significance even after Bonferroni correction. Nevertheless, without systematic replication, findings from this pilot study, especially the associations of breast cancer in relation to specific SNPs, should be interpreted with great caution. Support This work was supported in part by grants from the National Cancer Institute Grant # UO1 CA 122171. 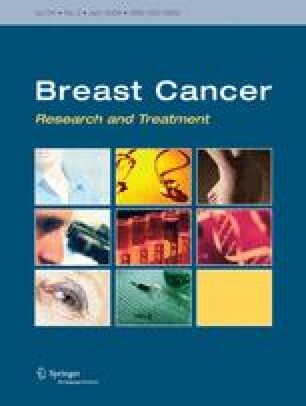 The authors wish to thank all the members of the Breast Cancer Family Registry (BCFR) and the German Breast Cancer Study (GBCS). Lambert GC (2007) Helixtree software version 6.0.2. Golden helix, Inc. http://www.goldenhelix.com.